As a business owner, it's always extremely helpful to be able to streamline your workflow. When we make updates to the 3dcart Online Store Builder, we keep this in mind as a goal to achieve: we want you, as a 3dcart store owner, to be able to do everything you need to do as quickly, efficiently, and easily as possible! This is the philosophy behind our redesigned Add a New Product page. Before the 7.5.0 update, new product creation involved clicking between several tabs. The new version combines these tabs into a single page, while still allowing you to access the tabbed system you're used to. When you click "Add a Product" at the top of your product list, you'll see the redesigned Add a New Product page. If you want to create a product very quickly and then come back later to add the details, you only need to complete three fields before you can save the product: Name, SKU, and Price. All three are marked with a red asterisk (*) to make them easy to spot. Scrolling down past Categories and Images brings you to the Pricing Information section in which you will find the third required field. If you want to go beyond the three mandatory fields, you can set up an entire new product on this single page. Directly below the Product Information section (shown in the first image), you will see the Categories section. Clicking "Select Categories" will open a window allowing you to select from your existing categories or add a new one. Below Categories is a section for Images, in which you can add images to your product. Below Images, we have the Pricing Information section mentioned earlier, followed by Inventory. 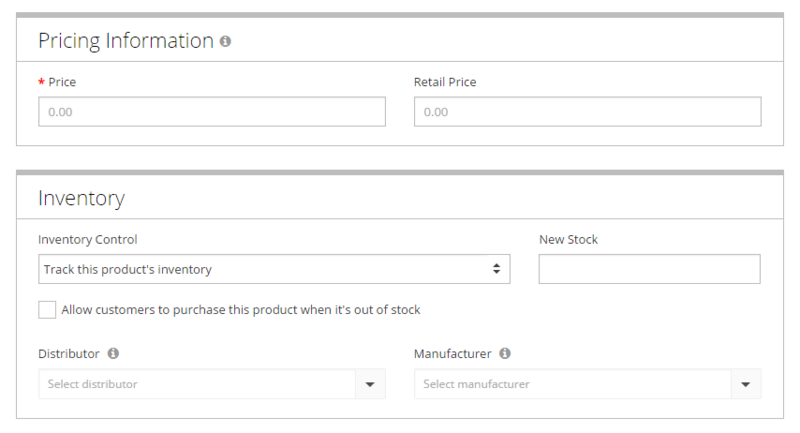 In the Inventory section, you can configure Inventory Control options and set the Distributor and Manufacturer. Below Inventory, you will find the Shipping Information section, in which you can define the product's weight, dimensions, and shipping markup, or designate it as an item with Free Shipping. The field generates the "boxes" around the options as soon as you type the comma, so typing "Small," will cause the boxed "Small" option to appear in the field. To get rid of any of the options you add, just click the X in the box to delete it. 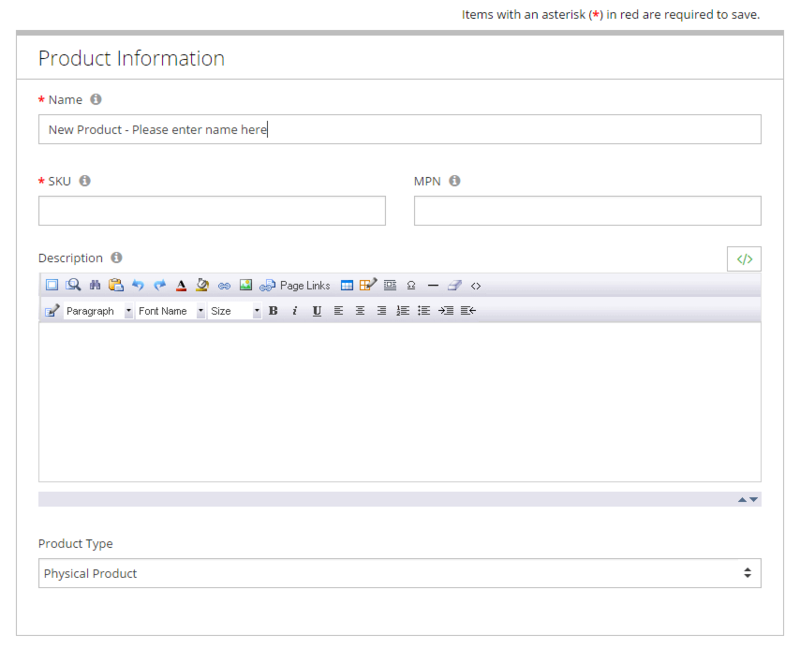 Once you have added a new product, even if you only filled out the three mandatory fields required to save, you can come back at any time to edit as normal, in the tabbed screen you are used to using. With the new Add Product page, you now have the option of quickly making a product with very little information, allowing you to do all the heavy editing later, or alternately to complete the majority of the product's information on a single screen. Remember, once you click "Save" you will be directed to the tabbed page for further editing. Hopefully this article has helped to explain the redesigned Add a New Product page in your 3dcart Online Store Builder. Please enjoy this new, convenient feature, and if you need any help, feel free to contact us. We'll see you on the road to eCommerce success!